As many of you are likely aware, a couple of months ago we put out a gameplay video of E1M2. It was a great way for people to get a taste of what Wrack is all about. While most of the reception to the video was very positive, many people offered suggestions on how to improve the map. After discussions with several people on the subject and doing some reflection on my own, I came up with some ways to improve Wrack’s maps that I’d like to share with you. #1). Side areas make for more interesting rooms. 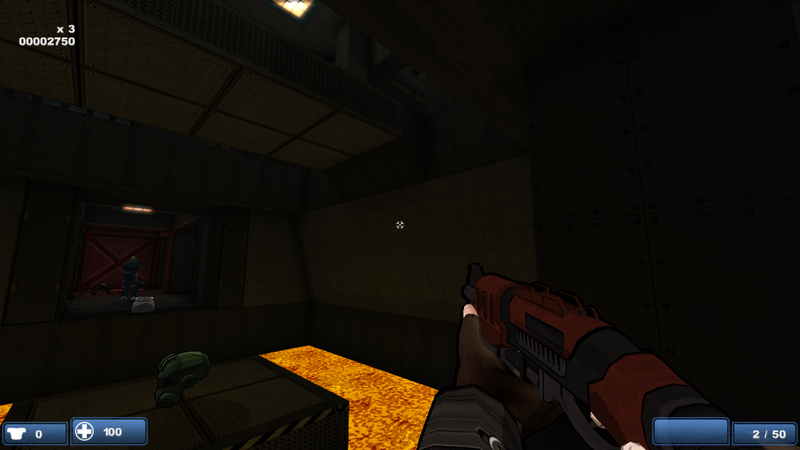 One of the comments that came up a lot was that “This map looks really boxy”. They had a point – a lot of the rooms were just some sort of geometric shape with a door or tunnel coming off of one side. That’s pretty boring. What I’ve found is that you can add some extra little nooks and crannies off of the door-less walls to make them more interesting. Given the room a more interesting shape. Put monsters off to the side, instead of stuffing them all right in front of the player. Given the player an extra optional area to explore. Set up an ambush that some players might not be expecting (SPOILER: There are crawlers in those tunnels (and rumors on those Internets! (too old of a reference? Probably. Also, too many parentheses? Probably as well.))). All in all, it definitely seems like a big improvement for the room! You too can use this simple technique to spice up your levels as well. #2). Have small extra areas that leave you back at their entrance to reduce linearity. Another comment that’s been mentioned a lot is that the levels seem to be too linear. I definitely like the idea of levels having some sort of progression – you don’t want people to be lost wondering what to do. At the same time, there should be some degree of freedom without people getting lost or not knowing where to go next. I figured that the best way to accomplish that would be to have extra areas, but instead of them being expansive areas that take you somewhere off the beaten path, they should be fairly small and take you back where you started so that you can resume the level’s progression. … there’s an extra area that lets you travel down under the bridge! Not only is it a completely optional path that lets you mix things up, but it also shows you the area from a new perspective, which is really nice in my opinion. Plus, upon exiting the area, it takes you to the same general place you started in, so instead of wondering “Uh, so what next?” … you know what to do! And did you feel like you were on a track? Hell no! You went off the beaten path, and found a max. armor bonus! HELL yeah! So hey, those are two mapping tips that I thought I’d pass along to you all. Hopefully you can incorporate these into your maps to help make them even better! Don’t forget – Wrack will be available for pre-orders this Friday! 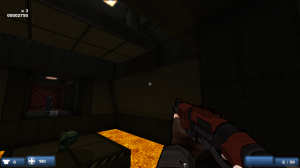 This entry was posted in Modding, Updates. Bookmark the permalink. You totally ruined the secret. I just discovered this on my own today :(. Well then I didn’t ruin it It’s supposed to be fairly noticeable anyway!